‘San Francisco officials and international representatives will celebrate a crowning achievement this morning when a refurbished dome is placed on top of the Golden Gate Park windmill that is considered the largest of its kind in the world. The 106-year-old Samuel Murphy Windmill, also known as the South Windmill, will receive its restored 64-ton copper dome at a “capping” ceremony at 11 a.m., a San Francisco Recreation and Park Department spokeswoman said. 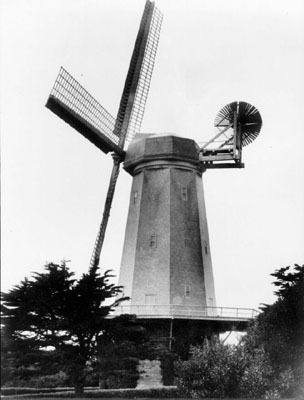 The windmill, which is one of two traditional Dutch-style windmills in Golden Gate Park, has been waiting more than 10 years for its cap to return after it was shipped to The Netherlands for restoration, according to the park department. The Murphy Windmill, named after a local banker and benefactor, was constructed in 1905 after the successful creation of the Dutch Windmill. The Dutch Windmill, which now sits next to the Beach Chalet restaurant, was built in 1902. At one time, both windmills were responsible for pumping as many as 1.5 million gallons of water everyday, according to the park department. But through natural corrosion and man-made neglect, the Murphy Windmill sustained significant damage. Its powerful sails, considered the longest in the world, were detached and abandoned and its wooden wraparound deck was also destroyed. 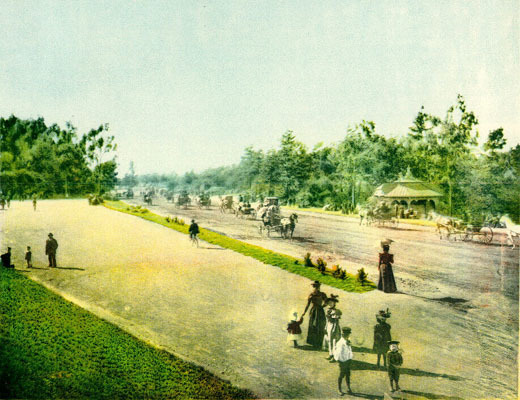 This entry was posted in history, infrastructure and tagged golden gate park, windmills. Bookmark the permalink.